CoilyQueens™ : Should you Co-wash or not? CO WASHING became very popular within the Natural Hair community around 10 years ago. Due to the drying effect of shampoo. Not long ago, most of the shampoos on the shelves were full of sulfates. Naturals became hugely aware that sulfates are extremely damaging to Afro coily hair. This made the technique of co washing the route to take. Co washing consists of replacing your shampoo with a cheap conditioner. You then would "cleanse" with the conditioner, forgoing the drying, damaging shampoo. The problem is that, conditioners do not remove, germs, old product or microbes from your hair. So all of that sits on your hair week after week, eventually clogging your hair follicles. When the hair roots are filled with products, excess sebum and microbes your hair growth slows or it falls out. Today you can easily find a non sulfate shampoo on the shelf. So co washing with a conditioner is no longer necessary. Co washing with a conditioner should never be used to replace shampoo. Conditioners are formulated to be applied to hair after cleansing. Not as a cleanser. If you want to co wash to refresh a wash and go that is good. But it should not be used for cleansing. 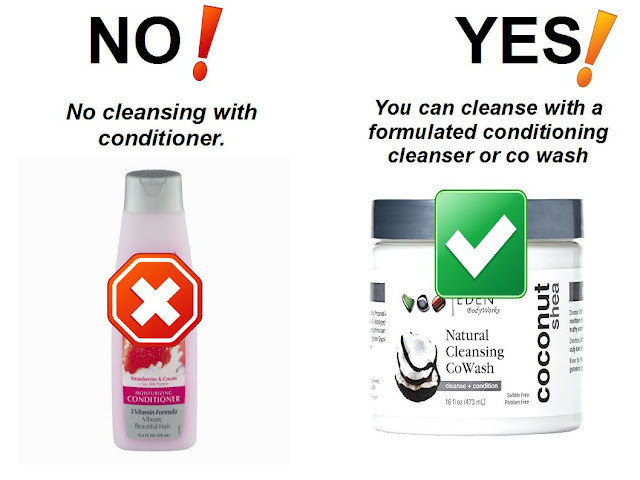 Because conditioners do not cleanse properly. Lots of naturals find good benefits from using a conditioning cleanser instead of shampoo. Conditioning cleansers, will state that on the bottle. It is a product that contains cleansers in it. This is okay to use. Many times naturals use the term co washing to describe both forms. It is hard to know which type of co washing one is referring to. Some products are labeled co wash. Whether it states co wash or conditioning cleanser, it will contain some type of cleansing agent. That is what you should look for, if you decide to co wash.
Today most shampoos are sulfate free. So co washing with a cheap conditioner is no longer needed.